Have you ever had a room in your home that you just absolutely hated, but it was always on the bottom of your priority list, so you just close the door and pretend it doesn't exist? That's how we feel about our master bathroom. It's not only super tiny, but it's hideous and practically falling apart. But because it's in our master bedroom, no one sees it but us. So, unfortunately, it has been at the bottom of the to do list for a long time!! Well, I'm excited to say we are finally tackling it for the Spring 2017 One Room Challenge hosted by Calling It Home. 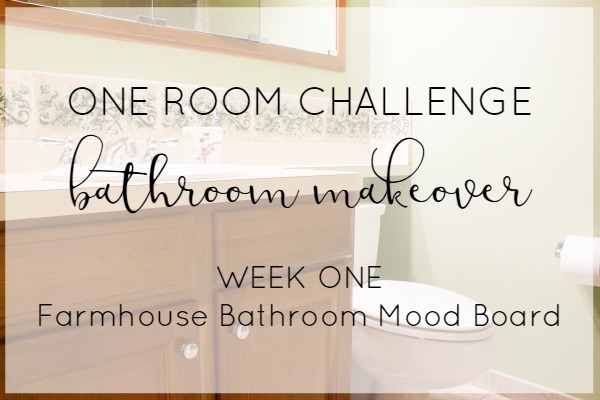 This is our second time participating in the One Room Challenge (ORC), and I am beyond excited! We gave our kitchen an overhaul for our first ORC, and not only did I enjoy the challenge of making over a space in six weeks, but the amount of community and support during the challenge was incredible! I am so looking forward to another great round of the ORC! Also... did I mention I hate glass shower doors? Who has time to keep them clean? Especially now that we have kids. And even when I do have time to give it a good scrubbing, it still looks dirty. I'm over it! The shower door has got to go, and a nice pretty shower curtain will take it's place! 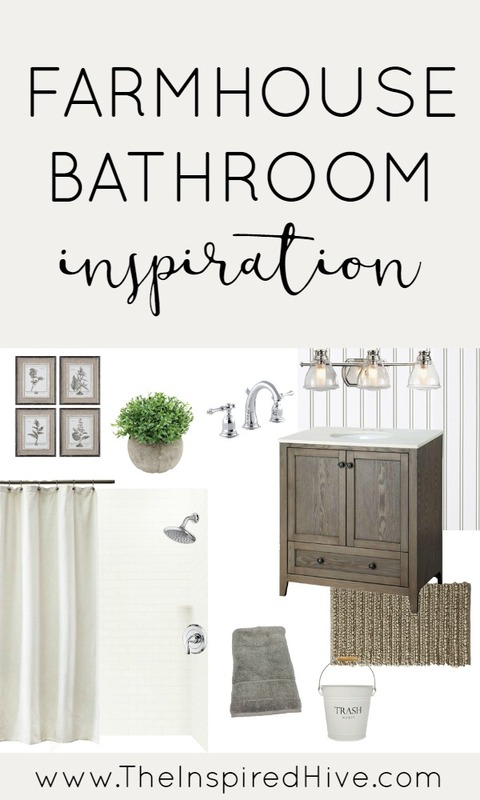 Our main goals are to redesign the bathroom with materials that meet our tastes but are also neutral enough for easy resale of the house later on. We also want to maximize storage and make the space feel bigger by using brighter more neutral colors. In addition, we've decided not to tackle the floor at this time to save ourselves some work since I'm in my third trimester of pregnancy (if you missed that announcement, you can read more!) and running out of time!! The floor tile isn't exactly something we would have chosen ourselves, but it is in good shape, and we think we can make it work for now by bringing out some of the more neutral colors in it through accessories and a change in grout color. We initially planned to keep the existing vanity. 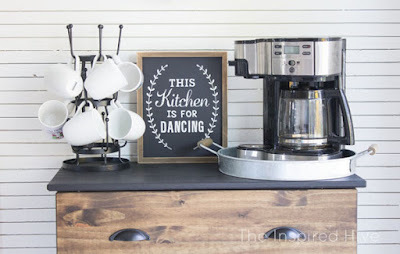 We were going to remove the part of the countertop over the toilet and change the rest of the laminate countertop to something brighter and more appealing. 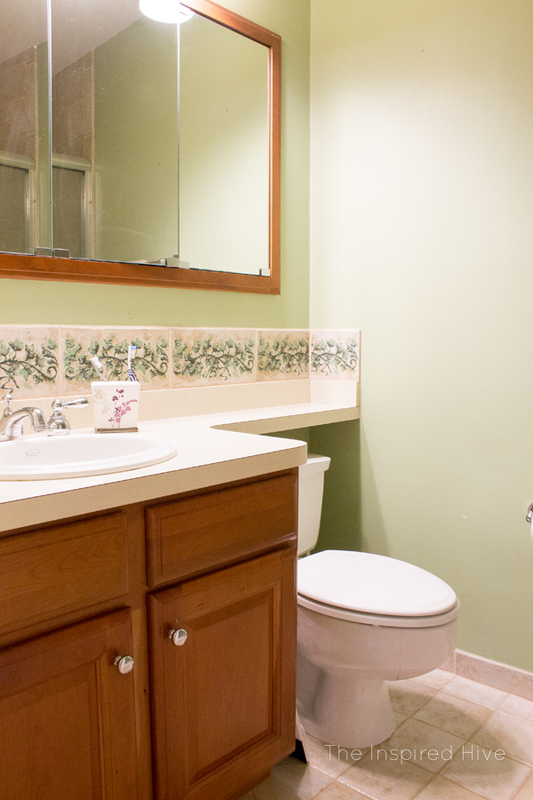 I like the sink and faucet, and the vanity itself could easily be updated with paint like we did in my son's bathroom. However, as we started pricing things out, we realized it wouldn't be that expensive to buy a brand new vanity that fits our style perfectly, gives us more storage, and ultimately takes up less space. 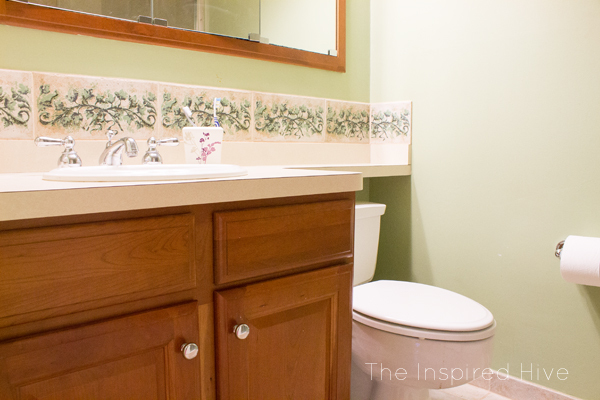 Plus, it would save us time rather than installing a new countertop and painting the vanity. We got lucky and found a great sale on a pretty, rustic style vanity that I can't wait to get installed! The shower will clearly be the biggest part of this project. 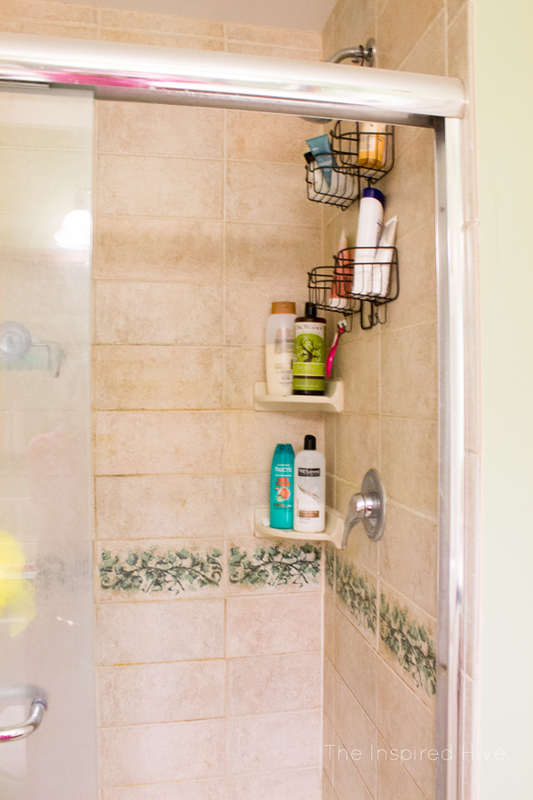 The shower walls need a complete overhaul! I am thrilled to be partnering with M-D Building Products for the One Room Challenge. They are a great source for all of the tiling tools and supplies needed to get the job done. In addition, to avoid the awful mold problem we currently have from happening in the future, we'll be using their awesome waterproofing system, PROVA. PROVA BOARD PLUS+ is a great alternative to using cement board as a tile backer and is fully waterproof and vapor tight. More details to come on how quick and easy it is to install! One thing is for sure, once you try the PROVA system, you'll never want to go back to using standard cement backer board! Other small changes we'll be making are fresh paint, adding some beadboard, and updating the light fixture. 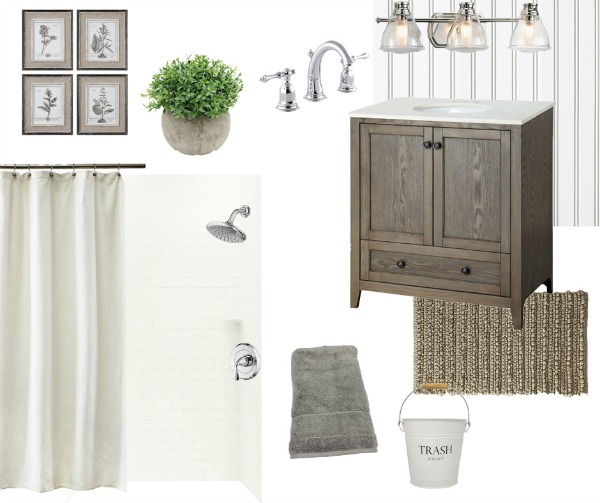 We'll give the space a farmhouse feel with accessories and neutral colored bath linens. Ready to see our design plan? Check back each week to see our progress, and don't forget to stop by Calling It Home to see the rest of the One Room Challenge projects going on! It's the ultimate source of inspiration if you have a room makeover coming up! Big thanks to our sponsors! I can't wait to share more info with you about them! This is going to be so amazing Nicole!!! Can't wait to follow along! Too funny that you went through the same experience!!! ;) Hopefully we'll make it through this crazy six weeks!!!!! 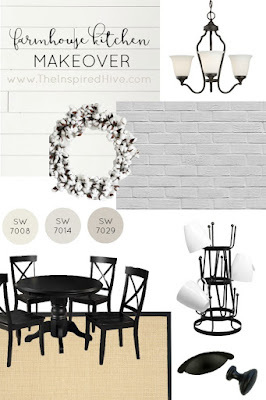 Love your mood board - can't wait to see it all come together! I'm so excited to see this transformation! This space definitely has a lot of potential and I know you'll make it look SO good! Can't wait to see the new vanity, too! Thanks, Bre!!! We are so excited to finally be tackling this space! So excited to follow along Nicole!! We are hoping to do our bathroom for the fall ORC so I'm excited to see your bathroom!! !